second leg at Udinese. Photo: Guardian. The team news for Champions League away matches is a little easier to deduce because by the time the post gets published, you know who is on the plane ride and who isn't. All five of the new signings from the end of the transfer window will make the trip to Germany. In addition to the injuries we all know about that are long term (Vermaelen, Wilshere, and Diaby), Aaron Ramsey picked up a kick on the ankle against Swansea and will be rested (he was noticeably limping at times). I have heard he trained yesterday before the trip, so he will hopefully be good to go at the weekend. Tomas Rosicky is still not fit, having picked up a knee injury on international duty. Yellow card accumulation in the play-off stage is wiped clean going into the group stage, so Theo Walcott is available for the trip. Arsene Wenger, however, will not be on the touchline because UEFA is ridiculous. All player suspensions have been served both domestically and in Europe. All players are available moving forward both in the Champions League and in England. 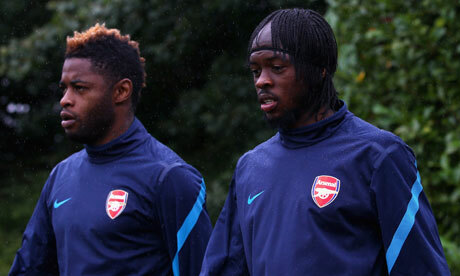 That means we'll see a return to action from Alex Song and Gervinho in this match, for the first time since the second leg against Udinese. Predicted Squad: Szczesny, Sagna, Koscielny, Mertesacker, Gibbs, Song, Frimpong, Arteta, Gervinho, Walcott, van Persie. Subs from: Fabianski, Santos, Djourou, Benayoun, Arshavin, Chamakh, Park. to be nicknamed the "Young Guns." Sounds familiar, no? Borussia Dortmund won the Bundesliga last season, but since have sold midfielder Nuri Sahin to Real Madrid and are without striker Lucas Barrios, who was injured in the Copa America. That is, however, not to say this team isn't dangerous anymore, and we all know drawing Dortmund was the worst case scenario from Pot 4 in the drawing. Dortmund are led by Mario Götze on the right flank. A rumored Arsenal deadline target, Götze is one of the brightest young talents in German football; he has nine caps for the German national team at age 19 and has scored twice at the international level. Last season was his first year with the first team, gaining the starting spot thanks to a foot injury to Shinji Kagawa, who is now also back in Dortmund's starting midfield. This year, Dortmund has taken seven points from five league matches and are coming off a 2-1 home loss to Hertha Berlin at the weekend. 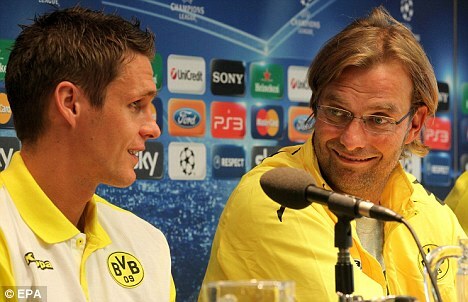 The loss snapped Dortmund's 18-match unbeaten run at home across all competitions. Götze did not feature for Dortmund at the weekend; he was suspended. Arsenal's win at Udinese to clinch their spot in this year's group stage was their first away win in Europe since beating Partizan during Matchday 2 last season. After that, Arsenal suffered successive road defeats to Shakhtar Donetsk, Braga, and Barcelona. The season prior in European away fixtures, Arsenal opened with a win at Standard Liege before conceding late to draw at AZ Alkmaar. They then lost 1-0 at Olympiacos (while fielding a reserve side, having already clinched the group), then lost away to Porto and Barcelona in consecutive knockout rounds. So, as you can tell, away fixtures have not been kind to the Gunners in recent history. Arsenal have won six of their last seven Matchday 1 group fixtures though, the only setback in that span being a 1-1 draw against Dynamo Kiev in 2008. 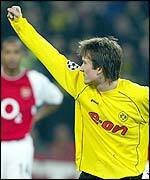 Dortmund's home form in their last trip to the Champions League included a win against Arsenal (detailed in "Match Facts" below,) a win over Auxerre, and a draw with PSV, which was enough to earn them qualification to the second group stage (this was 2002/03) where they beat Lokomotiv Moscow but drew Real Madrid and lost to AC Milan. They did not advance to the quarterfinals. The last time Borussia Dortmund qualified for the group stage of the UEFA Champions League, they were drawn in Arsenal's group as well; again, that was in 2002/03. The two sides split their two meetings, with each winning at home. Arsenal won 2-0 at Highbury with goals from Dennis Bergkamp and Freddie Ljungberg and Dortmund won 2-1 in Germany, with both of Dortmund's goals coming courtesy of Tomas Rosicky (one was originally scored a Gilberto Silva own goal), canceling out Thierry Henry's opener. Jens Lehmann was in goal for Dortmund in both matches. Both sides advanced to the second group stage, where both would fall one point short of qualifying for the quarterfinals. The last time Arsenal faced German competition was the group stage in 2006/07 when they faced Hamburg. Arsenal won 2-1 in Germany (with goals from Gilberto Silva and Rosicky) and 3-1 at the Emirates (with goals from Robin van Persie, Emmanuel Eboue, and Julio Baptista.) Arsenal won the group and Hamburg finished last. That 2-1 win away is Arsenal's only road win away to German competition in the UEFA Champions League era. They have lost four times on German soil. The officiating crew is from Italy; the referee is Gianluca Rocchi from Florence. Rocchi worked through the Europa League knockout stages last year, but did take charge of three Champions League group stage matches: Schalke's 2-0 win over Benfica, Manchester United's 1-0 win over Bursaspor, and Barcelona's 3-0 win over Panathinaikos. Rocchi showed 10 red cards last season over 27 matches, though those 10 came during the course of five matches meaning that in four matches last year, Rocchi showed multiple red cards. That included three red cards in Sampdoria's 2-1 win over AS Roma in January. On Friday, Rocchi took charge of his first Serie A match of the season, Milan's 2-2 draw with Lazio. He worked Portugal's 4-0 Euro qualifier win over Cyprus the week before that. Cyprus spent the last hour of that match on ten men. glamour fixture in that group: Plzen v. BATE. Photo: TSN. Today's biggest match sees Barcelona host AC Milan at the Nou Camp. Meanwhile, Chelsea hosts Bayer Leverkusen at Stamford Bridge. In the other match from Arsenal's group, Olympiacos hosts Marseille. Elsewhere today, Belgium's Genk hosts Valencia, Porto hosts Shakhtar Donetsk, Cyprus's APOEL hosts Zenit St. Petersburg, and Plzen hosts BATE. Tomorrow, with regards to England, Manchester United travels to Portugal to face Benfica, while Manchester City hosts Napoli. Also, Bayern Munich travels to Spain to face Villarreal, Lille hosts CSKA Moscow, Inter Milan hosts Trabzonspor, Ajax hosts Lyon, Real Madrid travels to Croatia to face Dinamo Zagreb, and Basel hosts Romanian side Otelul Galati.